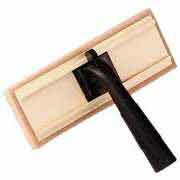 We have added a new project to the diydoctor website on using a paint pad when decorating in the home. A paint pad is easy to use as long as you have the right size pad for the job you are doing, and is easier to use if you have the specialist paint tray which has a built in roller to allow the right amount of paint onto the pad. You can also get long handled ones for painting ceilings. They give good coverage and are quick and easy to use, and like rollers should give an even finish if used correctly. They are also less messy to clean than rollers, which has to be a good thing!